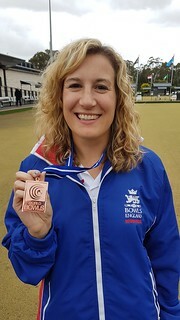 Oxford City and County’s Donna Knight won bronze at the World Champion of Champions Singles at St Johns Park BC, Sydney, Australia. Knight had qualified for the event by winning the Bowls England singles championship in 2016. The competition started with a round-robin with Knight topping her group by winning eight of ten games which won her a place in the semi final stages and securing at least a bronze medal. Knight faced Malaysia’s Emma Firyana Saroji, who had previously won the title in 2015. The first set saw Knight just lose out 11-10 before losing the following set 12-6. The final saw Saroji lose out to Wales’ Laura Daniels.